This New Year’s Eve, you and your family threw a great little party at home – you stocked up on some treats from Whole Foods on South College Avenue and made sure to grab party hats and noisemakers from Life of the Party. You and your husband toasted to 2017, and your kids squealed and burst into laughter and smiles when the clock struck midnight. Looking at your family, you know this year is the time to set a good example for the kids when it comes to dental health. Whose advice can you follow to keep your teeth healthy all year long and make sure your family follows suit? Take these tips from Dr. Shiloh Lindsey, your dentist in Ft. Collins, CO. Since Dr. Shiloh Lindsey was the valedictorian for her class at the University of Colorado Health Sciences Center School of Dentistry, she’s got lots of smarts and great advice to pass along to make sure her patients keep their teeth healthy all year long in 2017. Here are her top 3 tips. Most people don’t brush correctly and neglect their flossing regimen. Be sure to brush for two minutes – use a timer on your phone or switch to an electric toothbrush, since they’re programmed for proper time and have the right amount of pressure you need when brushing. Floss every day – even if you’re busy. And take your time while you’re at it. Avoid going too quickly and snapping the floss into your gums (ouch!). Make sure to slide the floss along both sides of each tooth and your gums to clean out bacteria properly. Since everyone knows that sweets cause tooth decay and increase bacteria in the mouth, it’s especially important to eat healthy throughout the year. Avoid sugary drinks like sodas and juices, limit coffee and red wine (since these stain teeth), and switch to high protein snacks or veggies rather than indulging in potato chips, popcorn, or candy. Also, be sure to load up on dairy and leafy greens, since these are a great source of calcium to keep teeth and bones strong. Some research suggests that eating cheese is a great way to go because it not only has the calcium you need, but can keep your saliva naturally balanced to kill bacteria. Have a look at this list of the best foods for tooth health. 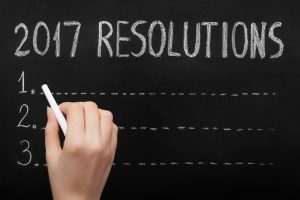 Regular dental checkups, cleanings, and preventive care are a sure-fire way to take care of your teeth in 2017. Doing all you can at home between visits will help get you along the path to a perfectly healthy smile, but this is no substitute for quality, professional care from Dr. Lindsey and the team at Aspen Dental Care. She’ll create an individualized treatment plan for you to give you the brightest, healthiest smile in Ft. Collins. Dr. Shiloh Lindsey and the Aspen Dental Care experts are accepting new patients – schedule your appointment today and keep your 2017 resolution to make dental care a top priority.